With its sincere message of hope taking on a more touching note for the third season, The Good Place remains essential viewing. If you read enough articles online about moralising drama, whether it be in film, television or literature, you’ll be led to believe that there’s a ton of media that we specifically need to be consuming right now, right this very minute, in reference to the lessons that can be drawn from these mediums in this particular time of turbulence in the world (aka Trump/Brexit). 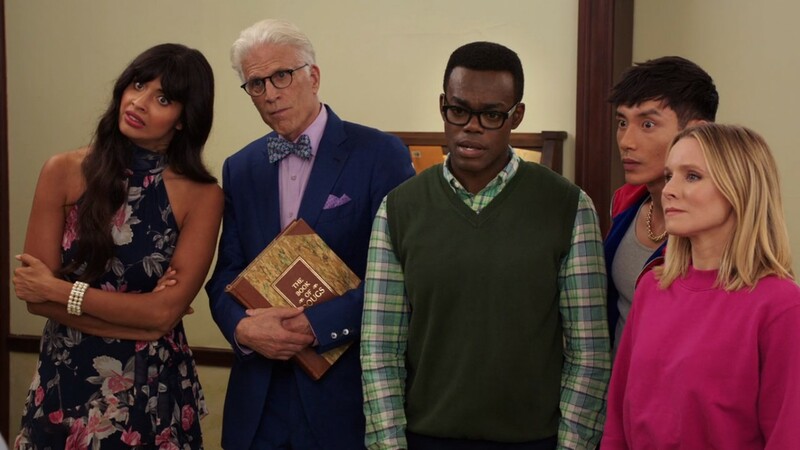 The Good Place is not one of the shows we all need right now – it’s the show we’ve always needed. Now in its third season, Michael Schur’s (Parks and Recreation, Brooklyn Nine-Nine) latest and arguably greatest televisual creation has fully immersed us in its otherworldly premise by now. Instead of settling into a traditional sitcom format however, it has continued to explore the implications of its boundless afterlife setting to full effect, taking The Good Place into new and exciting areas whilst maintaining the charm and ingenuity of the first two seasons. The two-part season opener, ‘Everything is Bonzer!’, picks up where things left off with Michael (Ted Danson) having hit the reset button once more; this time, Eleanor (Kristen Bell), Chidi (William Jackson Harper), Tahani (Jameela Jamil) and Jason (Manny Jacinto) are given the ultimate second chance, their original deaths on Earth prevented as part of Michael’s experiment to prove to the Judge (Maya Rudolph) that people can change for the better. What’s refreshing about The Good Place, in a landscape primarily made up of sitcoms that hit the refresh button each week in a classic Simpsons manner, is its overarching narrative. You think that the season and perhaps the show itself may have hit an impasse as Michael’s experiment on Earth seems to be going smoothly early on – is this going to become your standard Earth-based show now? Well, no. Soon enough a spanner or two is thrown into the works, overwhelming Michael and his brilliant AI assistant Janet (D’Arcy Carden), and we get sent in an entirely different direction, involving but not limited to the discovery of Jason’s father, a surprisingly kickass bar brawl in Canada, the answers to why so few people actually get into the real Good Place and, eventually, pandemonium – or, in other words, the final episode ‘Pandemonium’, a wonderfully touching goodbye for now. This season is genuinely engaging throughout as a moral drama, with plenty of twists and turns to keep us guessing right up to the final scene of the last episode. Thank God that it’s already confirmed for a fourth season. The show’s ability to ask thought-provoking questions every episode is a great feat, as it seamlessly retains a breezy tone and produces consistent laughs, often poking fun at contemporary trends such as flossing and Logan Paul. Most impressive, though, is the show’s increasingly imaginative applications of philosophy and ethics. It translates these complex subjects into layman’s terms, making the subject matter not only accessible for everyone, but actually inspiring. Any show that is able to encourage its audience to be better individuals without ever coming across as preachy or saccharine is one that should be treasured. This could not be achieved without the talents of a pitch-perfect central cast of characters, one of the most diverse and well-written in television comedy today. The endlessly optimistic disposition of the show’s writing and visual style positively infects this ensemble, who are clearly having a ball with the material and the chemistry between them. Danson, a bona fide TV legend, is remarkably endearing and hilarious in his enthusiasm for human trivialities, but, in the later episodes, it is in the shared arc of Eleanor and Chidi where Bell and Harper deliver unexpectedly poignant performances. They may even move you to tears, a place the show had not truly visited up until this point. Overcoming a slight early season lull, The Good Place continues to evolve as one of the most subtly profound shows around. I would say roll on Season Four, but we’ll need a little more time yet to completely process this one. Season 3 of The Good Place is available in its entirety on Netflix now.